You will need Node 8+, npm 3+ and git installed on your machine. We'll be building a chatbox, where users can join a chat room and chat with members of the room. Also, we'll be able to keep track of users online presence, that is whenever they join or leave the room. Node.js (v8 and above) and NPM (v3 and above) installed on your computer. A way to serve HTML files. We’ll be using http-server, which can be installed through NPM (npm install http-server). With Chatkit, you'll never have to worry about scale, reliability, or infrastructure, all that will be taken care of for you. To get started, we need to sign up for Chatkit. 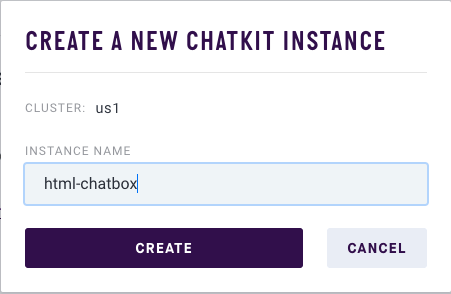 Once we are signed up, we need to create a Chatkit instance. We can do that by clicking the Create button on the Chatkit dashboard. You can name the instance whatever you like, but for the purpose of this tutorial, we’ll name it html-chatbox. Take note of the instance credentials (instance locator and secret key) as we’ll be making use of them to interact with Chatkit. Next, let’s create a room we’ll be using in this tutorial. We can create rooms programmatically from within our app, but to keep things simple we’ll use the Instance Inspector from the Chatkit dashboard. Follow the documentation on creating a user and room. Take note the room identify as we’ll be needing it later. First, we remove express-handlebars from the dependences, then we add the Chatkit Node.js SDK and CORS middleware. Using the Chatkit Node.js SDK, we create a new instance of Chatkit passing to it our INSTANCE_LOCATOR and SECRET_KEY (replace these with your own keys). Once the /users endpoint is hit, we create a new user with the provided username as both the ID and the name. Then return a success status if everything works fine, otherwise we throw appropriate errors. The /authenticate endpoint is used to authenticate incoming users, so as to make sure they are who they say they are. The page is divided into two sections: the form for entering a username and the actual chatbox. Only when a user has entered a username will the chatbox will be shown. So when a user enters a username and clicks the Join button, the chatbox will be shown and the username form will disappear. As you can see, we are using CSS to set the display of the chatbox to none. First, we get the username form, then add an event listener for when the form is submitted. Once the form is submitted, we prevent the default form behavior (that is, don’t refresh the page). Then we make a POST request to the /users endpoint on our server, passing along the username entered. If the request is successful, we hide the username form and display the chatbox. Next, we create a tokenProvider using the /authenticate endpoint of our server. Then we create chatManager instance locator, user ID and the tokenProvider. Using the chatManager, we connect to Chatkit. Once the connection is successful, we’ll have access to the current user. We then subscribe the current user to the room (replace ROOM_ID with your room ID) we created earlier. Setting messageLimit: 100 allows us to show users old messages (the last 100 messages). If we don’t want to show old messages, we can easily set messageLimit to 0. We add a onMessage hook to the subscribeToRoom object. This hook will be triggered once a message is received. What we are doing within the hook is simply creating some HTML elements with the message sender ID and message text, then append the created HTML to the chatbox. Once the chat text box is submitted, we prevent the default form behavior. Then we get the message entered into the text box. Using the current user object, we a sendMessage method passing to it the message content and the ID of the room (replace ROOM_ID with your room ID). Lastly, we clear out the text box. We get the first room of the current user (which is the general room we created), then get all the users that are subscribed to the room, which will be an array of users. Then we loop through the array of users. Each user object has a presence state, which can be either or online or offline. If the user is online we add the user to the list of users that are online. We are making use of a addUserElement function, which we’ll create shortly. You will notice we add the user’s ID as the id attribute of the element being created, that way it will be easier for us to remove the user element once the user leaves the chat. Chatkit has a onPresenceChanged hook, which we can use to know when a user comes online or goes offline. So, all we have to do is listen for these hooks and act accordingly. When the hook is called and a user's presence state has changed to online we add a new user to the list of users that are online if the user is not the current user. If the user has gone offline, we simply get the element by the user’s ID and removes it from the list of users that are online. Should be running on http://localhost:3001. Here, I’m using http-server, you can use your preferred dev server. 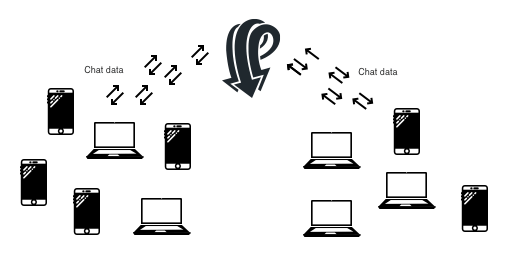 Chatkit is a powerful tool, we have only succeeded in scratching the surface of what it can do, check out the Chatkit website to find more about Chatkit and other awesome features it has.